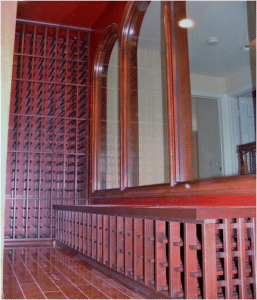 Custom Built Wine Cellars San Clemente California Coastal ProjectHi! What you are currently reading here is a project we recently completed at San Clemente, California. This is a project that we are particularly proud of because of the fact that we had to adhere to a set of limitations we had to contend with, yet were still able to pull off the entire project without a hitch. How were we able to do so? Well, read more of our San Clemente wine cellar project below! 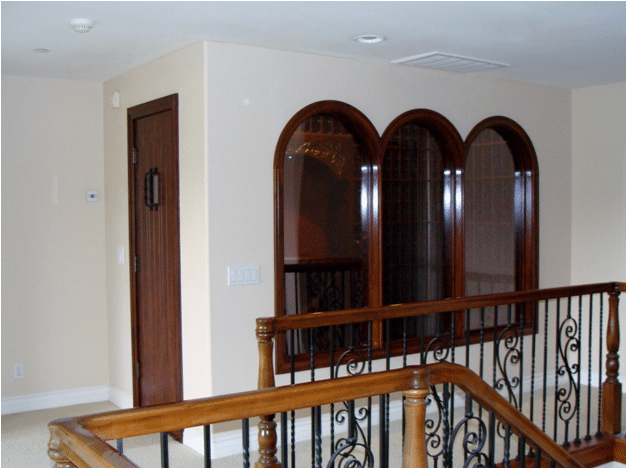 The client’s house in San Clemente was a recent purchase of his, and one of the first things he did was to have his new home’s wine cellar be renovated. The room was situated on the second level of the house near the top of the stairway. It measures ten feet long and five feet wide, and our primary challenge was to maximize the space inside it so it can hold the client’s 856-strong wine bottle collection. The finished design, which is pictured above, was mostly conceptualized by the client himself. The wine cellar door, in particular, was an original design of his. 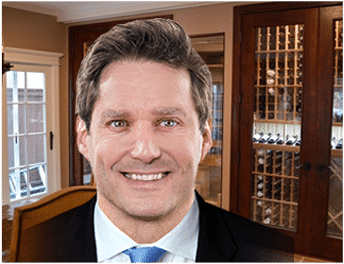 Of course, we also assisted him with the shop drawings by showing him the ideal spots in the room where we could install the contents of the wine cellar. Once we had been able to finalize the plans, we then started manufacturing the necessary products for the cellar. All of the wine racks we fashioned were made of clear Alder. As for the stain that the racks were to be painted in, our client selected chestnut as his color of choice. He then decided to top it off with a satin finish that would give the wine racks some necessary luster. The windows of the wine cellar were located on the right, but they were originally covered by a single-pane glass—a material that was largely ineffectual in regulating the temperature inside the wine cellar. We then decided to replace the single pane glass with a dual pane low-e glass that would provide the necessary insulation for the entire room. Since one of the aims of the wine cellar project was to maximize the space inside the room, we used the area below the windows for installing a table countertop that contained single-bottle storage openings. For sharp-eyed observers, you may notice that there’s not much of an aesthetic display going on with the project we were carrying out. As it turns out, that was precisely what the client intended: he was aiming the cellar to be a fully functional room, and the only way he could achieve that was to conserve space. For instance, each bottle opening measures three-and-three-quarter inches Joseph recheck the measurement it is too small for a bottle, which means it’s spacious enough to accommodate most standard-sized wine bottles offered at the marketplace. Even large-scale bottles like champagnes, Oregon pinots, and burgundy wines fit through the wine racks. 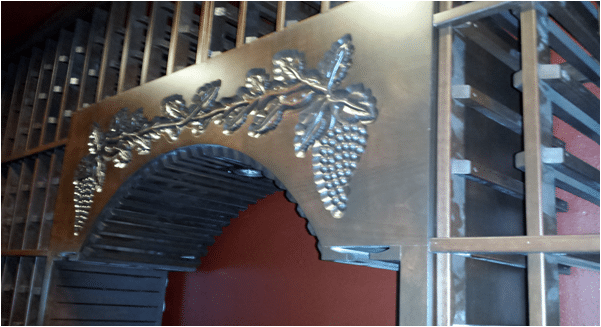 The client also had this idea of putting up a hand-carved façade over the arch covering the wine racks. With the addition of a spotlight in the ceiling, the tabletop area can now be illuminated like a feature to an art exhibit. We also included a diamond bin below the tabletop, which was essentially meant for bulk storage of large-form bottles. You may have noticed from the image above that there’s no visible wine cellar equipment or evaporators regulating the temperature of the wine cellar. That is because we decided to use a self-contained refrigeration unit in the form of the Wine Guardian system, which allowed for more wall space. The unit transports cold air by way of a duct and it can be easily “hidden” within the confines of the wine cellar. 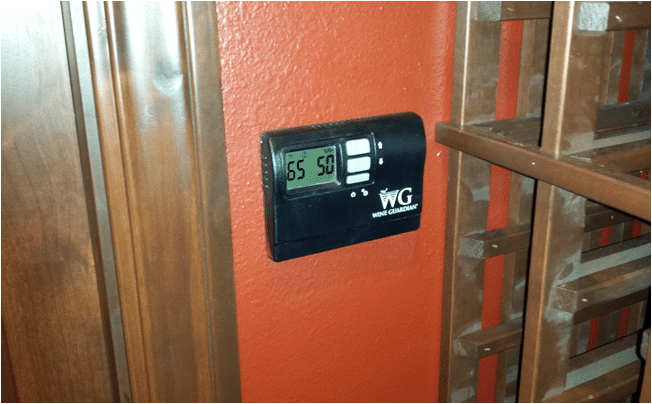 It also contains an intuitive temperature display that tells the client the specific humidity levels of the wine cellar. We were able to finish the San Clemente wine cellar project in three months, and the client could not have been any happier. If you have a similar project like the Santa Monica wine cellar we can help you with, we will be surely glad to hear from you. Cheers! Previous PostArctic Metalworks Repairs a Wine Cellar Cooling Unit Causing Water Damage in Los Angeles, California Next PostProtect the Quality of Your Wines by Hiring a Wine Cellar Cooling Unit Expert!